Does your child seem to have, um, selective hearing? You tell him (or her) to do this or that and you’re very lucky if one little smidgen of it gets done? Yeah, that can be infuriating to a momma. Ask me how I know. It turns out that there can be an honest-to-goodness reason and maybe, just maybe, he really isn’t ignoring you. Auditory attention and auditory processing are important cognitive skills that may need a little work. Luckily, there are loads and loads of quick and fun brain training activities that can boost your child’s ability to listen, remember, and act if necessary. 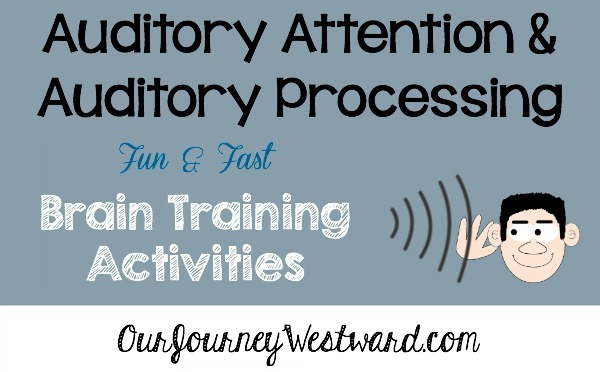 What are auditory attention and auditory processing? So, auditory attention is the ability to take in important auditory information while filtering out the rest. 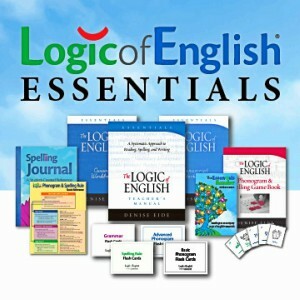 It’s also the ability to sustain or focus on auditory information for periods of time AND shift focus when necessary. And, auditory processing is the ability to take in and understand information you hear. Preferably, processing the auditory information at an acceptable speed. When listening, it’s often very important to remember one or more things for short or long periods of time. It’s important, then, that at least some of your brain training games practice the cognitive skill of memory, too. How do I know if we need to practice this cognitive skill? Difficulty remembering. This could be anything from difficulty remembering a few simple directions to forgetting math facts to an inability to remember the characters of a story that’s just been read aloud. Consistent difficulty understanding letter sounds or how sounds go together to form words. In other words, trouble reading. Consistently omitting sounds when speaking or saying common words incorrectly. Difficulty concentrating if there are too many distracting sounds in the background. Difficulty distinguishing sounds in general. Asking often for information or directions to be repeated. You might hear “Huh?” or “What?” a lot. Difficulty organizing or expressing thoughts. If you even slightly suspect your child might have a physical hearing loss, it’s extremely important to see a doctor for a thorough hearing test. Also, if your child struggles with many of the issues listed above, it’s best to see an occupational therapist for a thorough evaluation and plan of action. This is where we were. I first became frustrated when my son couldn’t seem to follow-through with a few oral directions at a time. He seemed to be listening to me, but at least one or two of a series of three directions would be forgotten between here and there. The problem was most obvious if I was listing a few chores he needed to do, which is why my first reaction was frustration. I thought he just didn’t want to do the chores. When I began to see forgetfulness in other situations where he was given a small “list” to do, the lightbulb came on for me. After several weeks of consistent brain training games and other activities to specifically work on auditory attention, processing and memory, I have a new kid! He is now able to remember very long lists of auditory information. We spent eight weeks doing daily auditory brain training work. Those eight weeks made a huge difference! Since we do a little brain training every school day, I still incorporate auditory activities quite often to keep the skills sharp. All of the games and activities I’ve listed below are meant for children 1st grade-adult. I don’t have any experience brain training with preschoolers. Choose one to three of the activities to do each day. Lean in hard on the fun activities so the less fun activities don’t seem so monotonous. I need you to… This was a very important activity in my son’s progress! 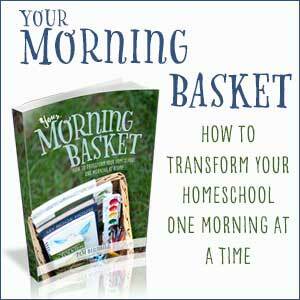 You begin with telling your child to do one thing. Before he’s allowed to do it, he must picture that activity in his mind and repeat the direction back to you. Make sure you hold up one finger when telling the direction and your child holds up one finger when he repeats it back to you. Then, he needs to go do the one thing he was told to do. The next day, go through the same process with two directions. You give the directions, holding up one finger for the first direction and two fingers for the second direction. Your child pictures the two directions and repeats them while holding up one finger for the first direction and two fingers for the second. He then does both things he was asked. The third day, give three directions. The fourth day, four. And, so on. We stopped once my son was able to do seven or eight things in order. Find the ___ and put it on the ____. You can use any objects you like for this activity. Quite simply, you give oral directions that your child must follow correctly. Start with easy directions and increase the difficulty as you see fit. The directions should only be given once. Simon Says. Yes, this is the same old-fashioned game you remember as a child. Red Light/Green Light. Here’s another old-fashioned game that’s perfect to practice listening skills, with the added bonus of your child needing to respond quickly. In case you don’t remember how to play, your child stands far away from you and races as fast as he can toward you when you say “green light”, but stops as quickly as possible when you say “red light.” If you have several players, the person who reaches you first is the winner. If someone doesn’t stop when you say “red light,” he must return to the start. Musical chairs. You don’t have to have a large group to play musical chairs, but it certainly helps to have at least a few people. Provide one less chair than you have players. While you play music, players walk around the chairs. When the music stops, players try to sit in the empty chairs. The person left without a chair is out. This is a great activity for responding quickly to auditory changes. Simon. Simon is a solitary electronic game where colored buttons light up and make sounds in various patterns. Once the game goes through a pattern, you must remember which buttons to press in order to complete the same pattern. Listening for sound patterns is a great cognitive exercise. Twister. The very premise of Twister is listening carefully to the referee as she tells you to put a certain body part on a certain color on the playing board. It can be played with one child as well as many. Anytime you can combine full-body action with the cognitive skill you’re working on, it’s a good thing. I Went Shopping. This game requires at least two players. Each person takes a turn repeating the current grocery list and adding a new item in alphabetical order. “I went shopping and bought an apple.” “I went shopping and bought an apple and a banana.” “I went shopping and bought an apple, a banana, and a cookie.” “I went shopping and bought an apple, a banana, a cookie and a d_____.” I love this game for both listening and memory! Who Comes Next? The Pictureka deck of cards is so silly, but very useful for brain training. In this game, the parent calls out two of the card’s characters and the child must find the characters and place them in the order mentioned. Next time, list three characters. The next time, four characters. And, so on to increase the listening skills and short term memory. Circle This. I love this activity. Download the Circle This Worksheet and place it in a page protector so you can use the same page over and over again. Here’s what you do… Give your child a dry erase marker. On the first day say, “Circle all the B’s.” That’s it. Your child should go from left to right through the letter rows and circle all the B’s. On each subsequent day, you add a new letter with a new direction. 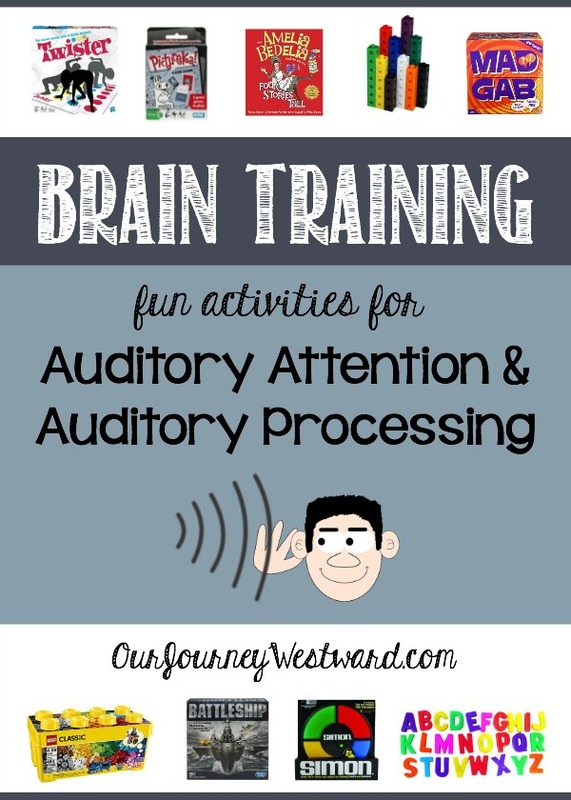 So…besides listening, this activity also practices visual cognitive skills and memory. It’s a blockbuster! P.S. 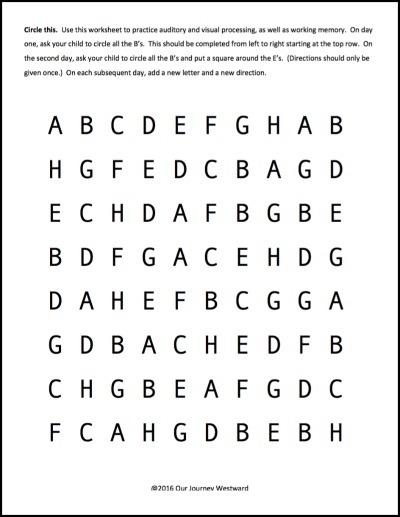 You could easily create other pages with different letters or numbers or images to keep this activity fresh. Telephone. I bet you’ll remember playing this game, too! You need at least two players, but more players mean more fun. The first person whispers something in the ear of another player. That player must listen carefully and repeat the message to another player (or repeat it aloud if there are no other players.) The goal is to listen carefully so that the message is relayed correctly from one person to another. Hand Clapping Rhythms. This is quick and easy. One person claps (or taps, stomps, snaps, etc.) a rhythm. The other person must repeat the pattern successfully. Start with short patterns and build as your child is able. Clue. When you think of the game of Clue, you don’t necessarily think of auditory skills. However, listening and processing other players’ guesses is a very important part of winning the game! As a bonus, logical thinking is practiced, too. Go Fish. One of our favorite go-fish games that isn’t “babyish” is American History Go Fish. Much like Clue, in order to win, listening to other players’ card requests is an important component. And, you get some history review in as well! Other historical go fish games you might like instead (or additionally) include: Ancient History, Medieval History, The Constitution, and Bible History. Rhyming Words. There are any number of rhyming games that you can play to help with hearing and identifying sounds discrepancies. Rather than give you a long list, here’s a link to several game ideas from Pinterest. Which Doesn’t Belong? Say a series of words that all belong in the same category – except at least one of the words. Your child must listen and discern which one (or more) doesn’t belong. Start with short lists and increase the difficulty as your child improves. P.S. You can take this activity to the next level with shared storytelling. One person starts an oral story. The next person adds to the story. This continues until you reach a decent conclusion to the story. Remembering characters and continuing plots is an active use of listening skills and is great for comprehension practice. Listening Game. With eyes closed, your child should try to identify sounds he hears. These can be indoor sounds, outdoor sounds, sounds of things you shake, etc. If you like, ask your child to point in the direction of the sounds for an added layer of auditory processing. For an added bonus of comprehension and vocabulary-building, ask you child to describe the sounds with words like heavy and light, fast and slow, or high and low. Listening Nature Walk. 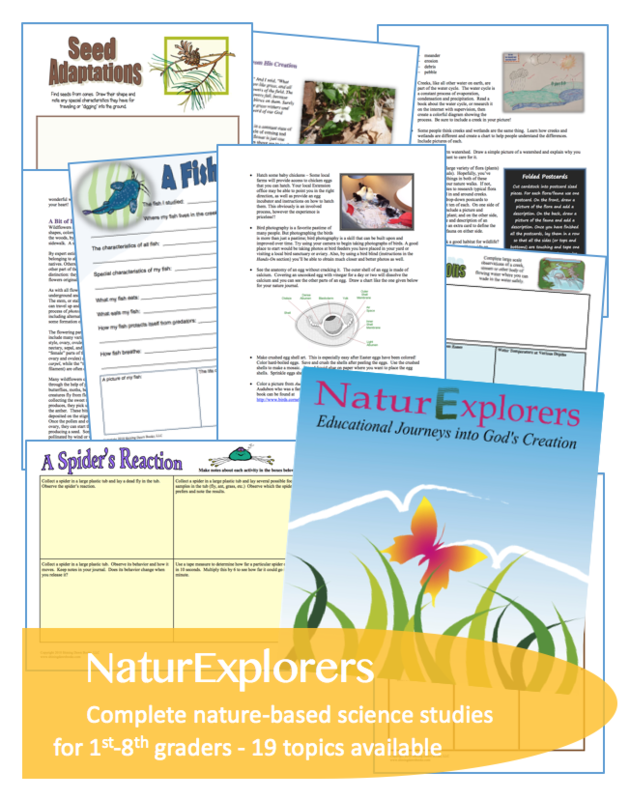 Turn an ordinary nature walk into a little brain training activity by identifying as many sounds as possible and noting them in your nature journal. Read with Inflection. Parents should always read aloud with inflection and expect the same of a child when reading aloud. 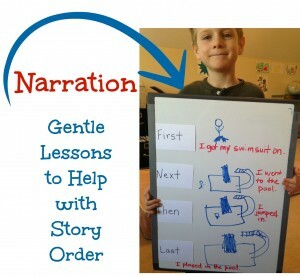 If your child struggles with inflection, practice this skill specifically during short narrations. Act or Illustrate. Tell or read stories aloud then ask your child to act out or illustrate the story. Either of these activities encourage listening for detail and listening for lengths of time. Books on CD. As your child listens to books on CD, they should follow along in the real book, if possible. If that’s not possible, just listening is a good exercise. This particular Amelia Bedelia book on CD set serves double duty. Because Amelia Bedelia takes figurative words literally, there are all sorts of fun consequences. The stories offer a great opportunity to discuss idioms and how the listener in a conversation really must understand what is being said. LEGO Do & Describe Constructions. This activity requires two people. The first person secretly builds a small figure from a few LEGO blocks. Then, the builder must give oral directions to the other player to build the exact same figure. The other player cannot see the original construction until his own has been completed. Then, compare the two figures to see if they are the same. If so, add a few more blocks to the game next time. If not, keep practicing with just a few blocks until both the builder (who is sharing oral directions) and the listener (who is building only from oral directions) are working well together. Give both players the responsibility of builder and listener at some point because both jobs are superb for building cognitive skills. Narration. Charlotte Mason homeschoolers, you already know how helpful narration is in the homeschool – for so many reasons. 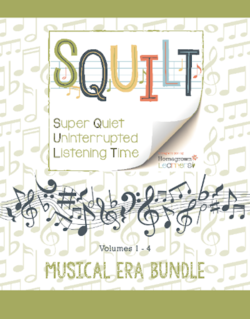 Now you can add auditory cognitive skills to the list of benefits! In this instance, it’s important that your child listens to you (or someone) read a short piece and then repeats it in his own words with as many details as possible. Auditory attention – check. Auditory processing – check. Auditory memory – check. It’s a goodie, albeit not quite as “fun” as some of the other game-like activities. Poetry Recitation. 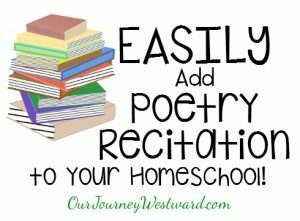 Another Charlotte Mason homeschooling habit that has great implications for auditory cognitive skills is poetry recitation. As an added bonus, rhyming words are often reinforced in poetry. Fun poems make this activity seem a little less scholarly. Catch Me If You Can. Read (or tell) stories that are well-known to your children. Change bits and pieces here and there to see if they can catch the mistakes. This is activity requires an extended amount of auditory attention. Yay! Popular Group Games. Catch Phrase, Taboo & Mad Gab might be on your game shelf already! Any of the three are fun practice for careful listening and fast listening. 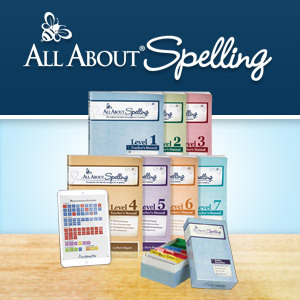 You can even enjoy them during a family game night and nobody except you has to know it’s all about brain training. I won’t tell. Wow. This turned into a giant article. I sincerely hope you are blessed by the activity ideas and your children have tons of fun improving their auditory skills. I find that more often than not learning disabilities are very easy to miss – even if you have experience with them. The “symptoms” can be so subtle and seemingly unrelated to each other – or even the actual problem. Yes, crazy. Glad you have it figured out! I homeschool my three children, and I’ve recently become aware that we all need brain training, not for any severe issues but to help make learning and life more fulfilling. 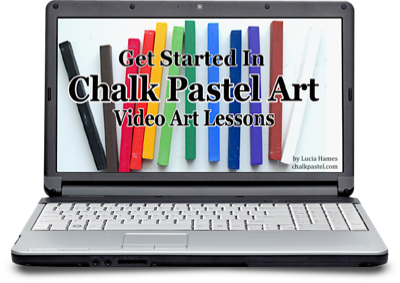 Your site is a huge blessing, as it has easy and affordable ideas I can incorporate right away. Thanks so much for taking the time to share such a wealth of helpful information! I’m so glad you found the ideas helpful, Meredith! I just heard your podcast with Pam Barnhill and clicked over. Oh. My. Word. This is just what I have been looking for! My middle son (we have four children) has ADHD and dyslexia. We do biomedical therapy and an in-home therapy called the Son-Rise Program for him (and his brothers who are both on the autism spectrum) but I felt like there was a little piece missing. I am PRAYING this brain training is that piece! His major challenges are in the auditory processing area. I absolutely love the idea of devoting an hour a day to training for this. I have tried other approaches in the past but they were screen-based and we are really trying to avoid screens. 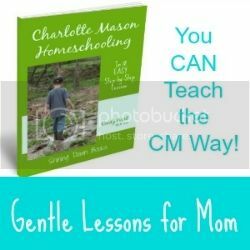 I absolutely love Charlotte Mason’s teachings and I have just begun narration with him (orally). His response is always the very last sentence I said and he says it as quickly as possible so he doesn’t forget! He has many struggles including mood swings and insecurities and low self esteem and I can see where using brain training would improve his confidence and have an overflow effect into those challenging areas. Thank you so much for sharing your passion about this! Can you offer any advice as to how to do the “session”? Do I just have a list of games I want to play? Do I rotate the games or pick a few from each category and do those every time? Cindy, I’m so excited you may have found the missing piece! There is no one right way to spend your time – except that you want to do a variety of activities during the session. Rotating the games would be a good way to start for sure. You might find this post (https://ourjourneywestward.com/brain-training/) helpful before you jump in. Additionally, you’ll find the actual training workshop I took linked near the bottom of the post. I’m always happy to set up a consult to talk you through some of it, too! Good luck! Great ideas, I also wanted to mention that a speech- language pathologist would work on all of the auditory modes of attention, memory, and processing. An occupational therapist does a lot for visual-spatial perception, processing , fine motor, and sensory regulation. Thanks for the information! Thanks for adding that info, Lori! Thank you! You have just made my life soo much easier with this article and yes I am blessed that I stumbled across it! This is going to make after school work a lot more fun! Thank you from Sydney Australia ! Great ideas! Have you heard of Brain Balance? I wanted to have my son go through their program, but decided to try to “train” him at home due to the high cost of the program. Thank you! I haven’t heard of Brain Balance. How’s it going at home? Thank you so much for writing the brain training posts. We just discovered our daughter may have some processing issues, and your articles have given me such hope and understanding! I’m so glad to hear this post have given you some hope, Tyra! I’d love to hear about your daughter’s progress after you work on brain training activities with her. Thanks for this valuable information. I am a 68 year old male who just got diagnosed with CAPD. Any suggestions for training and processing? Maybe there are definitive programs available. Hi Rob. I’m not a therapist. I would suggest you find a brain training center with a certified therapist in your area who has experience with CAPD. I think you’ll be glad for it! I am a learning and support teacher and I love your site. This gives me great activities and I share your site with parents who want to help their kids but don’t have the funds for programs. Great big thank yous from lots of us. I’m glad it’s been helpful, Noni! I am thinking of trying the, “I Need You Too…….” activity with my son. If you give a certain direction for day 1, would you use that SAME direction plus add a new one on day two? Then on day three, use those SAME two and add a third? Or would you have a new direction for all 1,2,3, etc. every single day? 2. Take the trash out. Or would each day be completely new directions? Stephanie, unless you are dealing with a child who has extreme difficulties remembering, I don’t think it’s necessary to follow the same steps (adding a new one) each day. It’s usually fine to start with one step the first day, then move to a different set of 2-step directions the next day, followed by a different set of 3-step directions the next day, etc. There will be times when you will want to spend several days practicing 3-steps or 4-steps (for example) if that number of steps seems to be difficult. InLong answer short, each day can be completely different. I’ve been following you on Pinterest for some time but have been off of Pinterest for a while and am just getting back in the swing. I would greatly appreciate any advice you might have from a homeschooling perspective in regards to getting our sweet daughter up to grade level, or advice as to what you’ve seen in that respect with your own child(ren) with auditory processing issues. Maybe we won’t get to “grade level” I don’t know, I just need to be able to have some idea what is a reasonable expectation. I am good with however this works out for her she is a sweet girl with a loving heart and she is very smart in many areas. While I do not want to frustrate her, I also don’t ever want to underestimate her or for her to feel like there are things she can’t do, and not push her hard enough. Our second homeschooling daughter has been a very different little girl. (Aren’t they all… ❤️ God’s way of helping to keep us on our toes! ) She is Guatemalan, adopted, and she came home in 2007 at 13 months of age. We could tell there were some problems visually and with language early on but had no idea the extent. She was from an area in Guatemala where they speak Myan and Spanish, and got here to her family who only speaks English. Bless her heart!! She wasn’t speaking anything when she came home, and her language developed VERY slowly…4 years old before we could understand even single words. At the time of her initial testing (in 2013) she was diagnosed with tunnel vision, double vision, lazy eye and micro-trope (not being able to see in 3-D). All together, this made for a very serious diagnosis of a whole batch of eye problems. She had already been seen by our family eye doctor and had glasses, but it was after seeing the specialist and a year and a half of vision therapy (in office and at home) that really turned things around for her visually. We were also told during her initial testing that had she missed one more thing on the auditory processing test she would have effectively “failed” that testing. We learned that she was left ear dominant, requiring the brain to take longer to process language (processed by most people in the left side of the brain) because it was coming into the left ear, going to the right brain and having to travel back to the left brain for processing. So, it takes her longer for her brain to process it all. The eyes were the most pressing issue. That initial testing was done when she was 6 or 7. She’s had multiple follow up tests done for her vision to determine her progress as we went through therapy and she continues to see Dr. Snider now about every 6 months to be sure that her eyes are maintaining the progress she’s made. She’s just turned 11, in 5th grade (on paper) and REALLY STRUGGLING with reading, spelling, recalling phonics blends, and handwriting. She doesn’t do any of these things without asking me questions or looking to me for assurance that she’s correct. So, on a recent eye checkup I talked with the doctor about these other issues we are having now that we are trying to move on with her homeschooling. She scheduled our daughter to repeat the hearing and processing tests in the coming month or so. I fully expect a diagnosis of APD and we will be given their therapy recommendations then as well. Dr. Snider is also a homeschooling Momma (I think they have 12 biological children!!!) I know she will have some homeschool related suggestions as well, but I don’t know if any of her children have had AP issues. . Between now and then I plan to do some of the activities you’ve recommended and purchase several of the game items you mentioned in this article. I would greatly appreciate any thoughts you might have about getting school things done while incorporating some of these games and activities and not taking all day (if possible). Thank you SO MUCH for this article!! !